Carbon Monoxide (CO) is an invisible, odorless gas that is produced through the incomplete combustion, of any fossil fuel (i.e. : oil, gas, coal, wood, etc.). Because you can’t see, taste or smell it, high levels of carbon monoxide can kill you without being aware of its presence. Exposure to lower levels of CO over time can, and likely will cause common Flu-like symptoms, and in some cases life threatening health issues. Everyone is at risk. Carbon Monoxide deprives the body’s ability to distribute oxygen to the organs, regardless of an individual’s health status. However there are categories who are significantly more at risk to CO exposure. CO robs you of what you need most: oxygen, which is carried to your cells and tissue by the hemoglobin in your blood. As you inhale CO, it quickly bonds with hemoglobin and displaces oxygen molecules. This produces a toxic compound in your blood called carboxyhemoglobin (COHb). Carboxyhemoglobin produces flu-like symptoms such as headaches, fatigue, nausea, dizzy spells, confusion, and irritability. Since symptoms are similar to the flu, and CO incidents most commonly occurring during Flu season, carbon monoxide poisoning is overwhelmingly misdiagnosed. As the time and levels of exposure to COHb rise, victims can suffer more extreme symptoms such as vomiting, eventual loss of consciousness, and eventually even brain damage or death. CO is produced by the incomplete combustion of any fossil fuel. Appliances such as a furnace, dryer, range / oven, water heater, or space heater. When appliances and vents work properly, and there is enough fresh air in your home to allow complete combustion, the trace amounts of CO produced are typically not dangerous. And normally, CO is safely vented outside your home. Problems arise when appliances malfunction, or proper exhausting is blocked by debris or cracks in the venting that allow the CO to re-enter the home. Fireplaces and wood burning stoves can produce unsafe levels of CO if they are not properly vented. Exhaust can also seep into the home from vehicles left running in an attached garage. This is a surprisingly common CO incident in winter months. Where to install carbon monoxide monitors? As Carbon Monoxide is relatively the same density and weight as the air in your home, it will rise with warm air and fall with cooling air as it circulates. The most important factor is that the unit is in an unobstructed area for airflow, and within hearing range in the event of an alarm. In the case of a CO EXPERTS Monitor, we suggest it be at eye level for ease of reading the digital display. This can be mounted to a wall using the mounting hardware or Velcro attachments, or utilizing the convenient clip-in stand included (model 2016) to place the unit in a convenient location to view. Carbon monoxide is most dangerous when you are asleep as it can lull you into a deeper state of unconsciousness, so alarms should ideally be installed within every bedroom and on every floor of the home for earliest detection and alerting. If only one unit is being installed, it should be located either within a main utilized bedroom, or within 10 feet of all occupied bedrooms in an adjacent hallway. How can you protect against carbon monoxide poisoning? Have fuel-burning heating equipment and chimneys inspected by a qualified professional every year before cold weather arrives. During the heating season, clear filters and filtering systems of dust and dirt. Be sure to open the flue for adequate ventilation when using a fireplace. Inspect the pilot lights on natural gas appliances to ensure that the flame is blue. When a flame is mostly yellow in color, it is often likely producing CO.
Clean out lint and debris that may build up in the clothes dryer vent which leads to the outside of the house. Never use generators or barbeque grills indoors. Only use outdoors in a well-ventilated location away from windows, doors and vent openings to the home. Never leave a vehicle (or any combustion engine, i.e. lawnmower / snow blower) running in a garage, even for short periods, and not even if the overhead garage door is open. Install a CO alarm outside each sleeping area and on every level of the home, including the basement, as recommended by the National Fire Protection Association. Be sure space heaters are vented properly. Unvented space heaters that use a fossil fuel such as kerosene or propane can release carbon monoxide into the home. How do I prevent CO in my home? Check furnace filters and filtering systems. Check forced air fans for proper installation and to assure correct air flow of flue gases. Check burners and ignition systems and pilot lights. Check all venting systems to the outside of your home. This includes checking flues and chimneys for cracks, corrosion, holes, debris or blockage. Animals and birds can build nests in chimneys, preventing gases from escaping. Vibrations can shake vent pipes loose from gas dryers or water heaters, preventing CO from being vented properly outside. Check all other appliances in the home that use fossil fuels such as natural gas, oil, propane, wood or kerosene. Appliances include water heaters, clothes dryers, kitchen ranges, gas heaters, ovens or cooktops, wood-burning stoves, gas refrigerators or alternative power sources such as generators. What to do if my carbon monoxide alarm goes off? Never ignore an alarm! It is very possible that you won’t be experiencing symptoms of CO poisoning when the alarm sounds. That doesn’t mean there is no carbon monoxide present. The alarm is designed to go off before you may feel sick, so you have time to react and take action. Operate the Test/Silence button, and if equipped with a digital display and “recall” feature, note the level displayed to convey to First Responders or Service technicians. Call your emergency services, fire department or 911. Immediately move to fresh air—outdoors or by an open door or window. Do a head count to check that all persons are accounted for. Do not reenter the premises until the emergency responders have arrived, the source of CO identified and disabled, and the premises have been aired out and is safe to reenter. After following steps 1-3, if your CO Alarm reactivates within a 24-hour period, repeat steps 1-3 and call a qualified appliance technician to investigate for other possible sources of CO. If problems are identified during this inspection have the equipment serviced immediately. Note any combustion equipment not able to be inspected by the technician, and consult the manufacturers’ instructions, or contact the manufacturers directly, for more information about CO safety and this equipment. If no sources of CO can be identified within the home, be sure that motor vehicles are not, and have not, been operating in an attached garage or adjacent to the residence. How do “standard” carbon monoxide alarms work? Standard (Retail brand) carbon monoxide units alarm according to the UL Standard UL2034, or related Canadian standard CSA 6.19. These alarms (at these standards) are designed to protect healthy adults from high levels of carbon monoxide. The standard does not require an alarm to ever alarm for concentrations below 70 ppm. Note: All alarm and display levels listed above are dependent on the “minimum” CO levels remaining at or above an alarm point during the allowable time periods associated. For example, if a concentration of 75 ppm were measured for 55 minutes and suddenly dropped below the 70 ppm level for a period of time (i.e. an exterior door was opened in the home allowing for some dissipation), the unit then may restart the countdown to meet the full minimum 60 minutes above 70 ppm to go into alarm status. The above is true for all UL 2034 / CSA 6.19 standard alarm points of 70 ppm, 150 ppm, and 400 ppm. 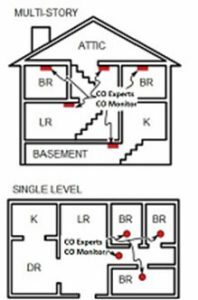 How are the CO EXPERT Low Level Carbon Monoxide monitors different? Standard CO detectors don’t fully protect the typical family – especially the unborn, small children and the elderly or the sick. You can offer real protection to your customers by bringing this life saving monitor to every service call. All CO EXPERT Monitors are continuously scanning for the presence of carbon monoxide and will alert you to the presence of low levels of carbon monoxide in seconds. The CO EXPERT Monitor will inform you of a problem before CO reaches dangerous, even deadly levels, long before other monitors or detectors even begin to work.